Newport NH – At 8:04 AM the Newport Police Dispatch received a 911 emergency call from a resident at 289 Maple Street reporting that his house was on fire. The first Newport Police officer on scene reported heavy smoke and fire coming from the roof and eaves. Upon arrival, the first Newport engine requested an upgrade to a first alarm due to substantial fire conditions. At 8:23, a second alarm was requested for additional tankers to the scene. Due to the volume of fire and compromised interior conditions, fire attack and suppression were limited to exterior operations. The fire was called under control at 9:32. Bradford Road remained closed to traffic for approximately two hours. One resident was home at the time of the fire. He was asleep downstairs on a couch when the fire started. A single smoke detector was located in the kitchen area, but was reported to be inoperable. Fortunately, as smoke began to fill thebuilding, the resident was awoken by his pet cat. Both the resident and his cat were able to safely exit the building. The home is deemed to be a total loss. Firefighters were able to save and secure some valuable tools in the back part of the house. The fire is not considered to be suspicious in nature and may been started by a woodstove in the basement. The dwelling was not insured. 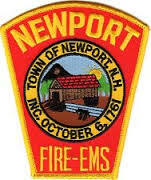 Other Newport departments assisting Newport firefighters on scene were the Newport Police Department and the Newport Highway Department. Mutual Aid Departments providing fire apparatus and manpower at the scene were Claremont, Croydon, Goshen, Lempster, Newbury, New London, Sunapee and Unity. Anyone with additional information regarding the fire may contact Newport Fire Chief, David McCrillis, at (603) 863-1416 or the Newport Police Department at (603} 863-3232.